This week has been cool and mostly bright which has seen the usual february catches of rockling, flounders and the odd Plaice. I have been away so i havent personally been able to catch up on reports but i have had a few emails letting me know whats being caught so thanks to those that emailed. 'I cast out my two rods and then waited ten minutes before i got my first bite so i reeled in and my first ever sea bass was on the end. It was under sized so i through it back but at least i caught one. I also caught 3 rockling and all the fish were taken on lug. There was i person who came up to me and asked if i'd caught any codling because he had caught some there on the friday before'. Congratulations to Sam on his first Bass. 'Ben fished the Hope Inn for a couple of hours on fri afternoon and had 13 rockling and 4 pout on frozen black lug and fresh king rag. This weeks catch report is unfortunately small. This is mainly due to the terrible weather we have had this past week which has made many marks very difficult to fish. One thing is that if you have been along the Worthing to Brighton coast you will have had the chance of catching masses of timber. As for the fishing. Harry fished Shoreham east arm on Friday 18th eve and had Dabs, Whiting and a Dogfish. There was also a Codling around the 3lb mark caught. Similar species are being caught along the coast at marks such as Seaford, Newhaven, Hove. Pevensey bay has also had similar catches with the added bonus of a few nice Flounders and the odd Schooly Bass. Brighton Marina has been closed most of the week but when it has been open and fishable there have been quite a few small codling as well as the usual whiting and pout. There has also been the odd plump Flounder. This week has seen strong S and SW winds which have really stirred the water up. This has caused problems at some marks as they have been near to unfishable and weed has also been an issue but there have still been some promising reports. Glenn had a nice Flounder (pic below) first cast but couldn’t follow this up with anything else after, the good old curse of the first cast eh Glenn. He also said that a pleasure angler next to him had a Bass around 3lb so there seems to be a few about at the moment. Jay (SSF reporter) fished Pevensey on Saturday eve and Newhaven East arm on the Sunday with his mate Rye. Between them they had a pretty productive session at both marks. At Pevensey, they fished until 2300 but decided to leave as the weather became too much. They ended up with 20 whiting between them. They then fished Newhaven East arm on the Sunday armed with fresh lug, mackerel and a variety of shell fish baits. They had almost a fish a cast with loads of whiting, soime around the 1lb mark. Approx 3 Dabs each, a small Codling and a nice sized Flounder. Some Pics from the session have been added below. Seaford, when fished, has still been turning up some good fish, with similar reports to that of what Jay and Rye caught with the added bonus of a few codling between 1-2lb. Me and keith fished seaford on saturday night.We had a few small whiting but had to pack up after only about 2hrs as there was huge amounts of seaweed being washed up and getting caught up in our lines.This was not the usual small stuff that gets stuck in the leader knot this stuff was huge and even had roots on the end whrere it had been ripped out of the sea bed and some of it was about 4 foot + tall and was so tough we had to sit down and cut it out of our traces!! just thought i would let you know so if anyone is thinking of fishing seaford soon it probobly best to leave it for a while to let the weed disappear. This week has again seen mixed weather which has meant there has been some nice catches when people have managed to get out and wet a line. Unfortunately there are not any pics or vids this week but if you have a picture of your catch, big or small, then please send it to me with a brief report. before having to leave. All good size and weighed 3lb 2 oz between them. Full of roe which is why they were quite heavy. We got there at around an hour before high tide which was at 08:46. We were using lug and slipper limpet and as soon as the tide was going out I caught a reasonable sized pouting. Then a bit later i lost a flounder because i had some sea weed blocking the bale arm of my reel but soon after that i made up for it by catching another one. It all went quite until i had big pulls on the rod so i reeled in and i could feel that there was a big fish on the end but it came of in a breaking wave we then decided to go after that fish was lost. Not a great days fishing we spent 3 1/2 hours there and caught 1 pouting 2 flounder and almost a codling. The people who were also there weren't catching much either. Pevensey has also been producing some good numbers of dabs, whiting and pout along with the odd Codling after dark mainly on fresh lugworm. so overall quite a pleasant day ended with 14 pout 16 whiting 5 rockling 3 micro bass and 2 Allis shad! Just a quick report from saturday 5th. Fished from low tide til an hour after high saturday night using frozen lug and squid. A couple of hours after low tide I pulled in a 5 lb codling followed by a jumbo whiting an hour later weighing 1lb 12oz. Brighton Marina East arm has fished well when people have managed to get on there. There has been some nice sized whiting in good numbers as well as quite a few Flounders and Eels showing up in the dirty water. Shoreham West arm has produced some good dabs and flounders on most baits with the usual whiting also putting in an appearance. Hopefully i can make up for it with the 10min video of us Team SSF guys catching Codling, Doggys, Whiting, Pout and Dabs off Dover Breakwater (30/12/07). Although its not sussex, it is a fishing venue i know many of you visit throught the winter so thought this footage may be of interest. Also there is a brief guide to baiting up with lug worm (black and yellows) towards the end of the vid for those of you that are interested. If you dont want to watch the video then there is a written report at the end of this report section. As for the weather, it has been pretty rough which has made fishing many venues hard. Jay fished Pevensey Bay on Sunday 30th and had Flounders, Dabs and whiting during daylight. There were alos quite a few Rockling about but unfortunately no Codling. Seaford has been producing similar catches as Pevensey with some nice sized whiting. Brighton and Hove beaches have been producing some nice whiting to good sizes after dark along with the odd plump flounder and schooly bass. Hove Beaches has seen a few Codling around the 2lb mark after dark as well. Brighton Marina has been closed most of the week due to the strong winds so unfortunately there is little to report from there. Shoreham (behind the power station) has produced a few dabs, rockling and flounders during daylight. The plan for the ssf lads (me, Glenn and John) was to target Codling and every bit of our bodies was crossed in hope that the string winds would die down and we could get the boat out to the breakwater. We left Brighton at 5am and headed to Dover while. When we arrived we were delighted to see no wind and little chop on the water which meant that the boat was going. We also met with Pete, our fishing buddy and got the boat out there. Everything seemed perfect as we were getting out there the first day after strong winds which would mean there would be plenty of colour and food in the water. We got on the breakwater and managed to get pegs 68-83ish between 4 of us. First hour was good with at least a fish a cast. I managed to hook into a codling of 2lb 1 1/2 caught on a 3 hook flapper, size 1 hooks and yellow tail lug fished on the outer wall. Shortly after i hooked into a nice Codling of 3lb 3oz caught on a pennel rigged whole squid fished 40 yards from the wall on the inside. in between this action we were constantly catching doggies, whiting and pout, so many in fact that we lost count. At about 11ish things slowed for an hour, well we say slowed down but it was actually only 1 or 2 casts without a fish. Things picked back up around midday with double and triple shots of fish not uncommon and a few nice dogs and pout up to 1lb. then Glenn had a Codling of 2lb on lugworm fished on the inside on a 3 hook flapper. catches continued and then John managed to get his Codling which he had been dying for. It weighed in at 2lb 1 1/2oz. I then also managed to get one 2lb 7oz on a 3 hook flapper and lugworm. 4 of the 5 codling were caught on the inside of the breakwater, the only problem was the snags. We continued to catch fish right until the end of the day but ni more codling. We had a great day with some nice fish and although we didnt quite get the numbers of codling we were hoping for we were not dissapointed with a pleasant days fishing and some nice fish. Last week saw continued strong winds from the S and SW, which slowed down and swung around to a light easterly by the weekend. This meant that earlier in the week the water was dirty with better catches, which have slowed down as the week progressed and the water cleared. Brighton Marina has produced a range of catches. early in the week there were whiting and pout in the day and night. 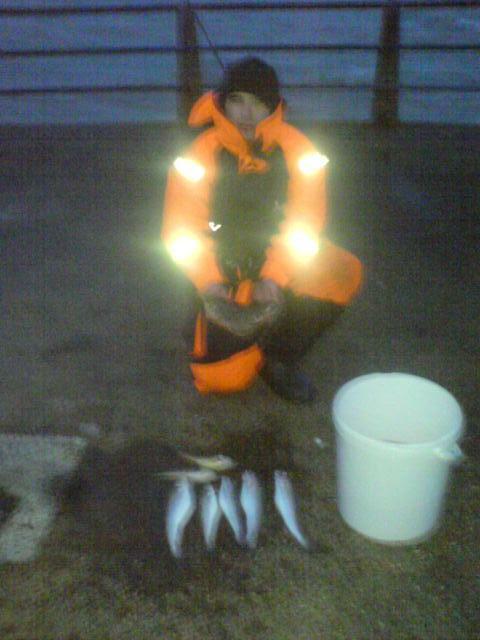 As the water cleared there were 3 mackerel caught on wed and the whiting are now being caught after dark. There was a nice bass landed near the end of the east arm on slipper limpet weighing 7lb 4oz. There have been a few flounders caught during the day as well. 17 fished and lets just say the fish werent biting. With the sea being calm and clear we knew there werent gonna be many fish caught, but i still busted a gut to get slipper limpets and red rag to hopefully catch some flounders. To cut a long and boring story short, only 3 out of the 17 anglers weighed in (2 wrasse, 2 flounders and 1 rockling) that did include myself. I came 2nd with a lovely winter wrasse of 1lb 10oz (Pic below) which did take me by suprise bcos i thought they'd be long gone by now. Keith, beat me by 1oz with a flounder, wrasse and rockling for 1lb 11oz and one of the old boys Paul had a 14oz flounder for third. 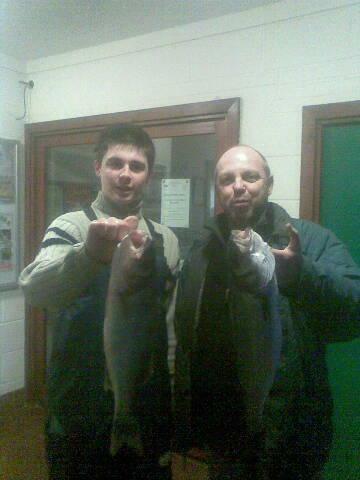 Me and my dad got to pevensey at around 14:20, high tide was at 15:00 so we cast out straight away. We soon caught a small rockling and then re-cast. 5 minutes later i huge tugging on my rod all most pulled the stand over i reeled in and thought a had my first codling but it was a big whiting instead. We caught another rockling and a small whiting, as soon as the sun started to go down the flounders came out and every one was catching them. In the end we caught 4 flounders 2 whiting and 2 rockling. All fish were taken by lugworm and slipper limpet. just thought i would let you know about the end result of the session i had, on sat night. fished at the ice cream hut in seaford, just to the right of the beachcomber pub,low tide approx 10.00 pm. I managed to get there at around 8.15pm. i dont know if you know but seaford has been fishing so much better over low tide now for a couple of years, especially for the codling. i was using my zziplex GB3 matched with the new abu 6500 premium mag, also had my abu surveran sport and the new daiwa 7HT mag which i had only recieved that morning. Decided to use 3 traces , a pulley pennel, 3 hook flapper fitted with size 2 kamasan b940s, and a custom made 6 foot bomber rig. I was very suprised to see only two other lights on the beach from splash point to the tide mills. any way the final out come was as follows 42 whiting of which all but 2 were over 28 cm, biggest was 36cm just over 1.5lb, 4 nice pouting around the pound mark, a codling which just tipped 35cm so that went back, and finally on my last chuck of the night i caught a sole , plaice and a flounder all on the same 3 hook rig not bad for a 4.5 hour stint, fish were still there in nos when i left, all fish were at all distances which meant the shoals of whiting must have been huge, quite a few very good whiting getting on for specimen size, (my dogs loved every one of them) one of them days where i couldnt put a foot wrong. 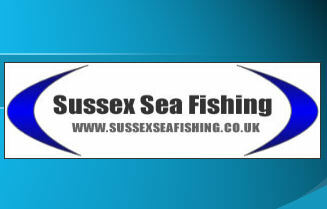 Jay Bradley fished Seaford (14/12/07) as well and he fished near the buckle car park. He caught 2 Flounders, 4 nice Dabs, 3 undersize Whiting and one big one. Like Kevs report all fish were at distance. Jay did try in close but had no luck. Fish were taking king rag and lug & squid cocktails. He also tried fishing near the beachcomber and seemed to loose gear on a snag (musscle bed). Hove beaches has had a few whiting after dark which is similar to Brighton beaches and both should produce a few Flounders in coming weeks along with the rockling in the daytime. While the water is clear its probably best to wait and fish after dark, or wait until we get some more SW winds to stir the water up a bit. 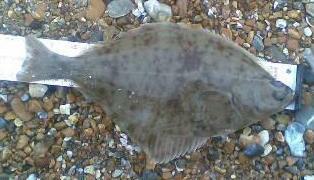 Shoreham arms have produced a few Flounders, Whiting, Dabs and rockling in daylight and after dark.